Making the most of his luck with non-figuration, Manessier “was able to renew a special relationship between man and nature, re-establish the harmony between creative intuition and sensations, restore to its highest level a pantheistic feeling, transformed and exalted by a profound and sincere religious need. These difficult attempts at communion between earth and the heavens, reconciliation between mankind and God or between the spoken word and writing, occur before our eyes… a majestic song of hope… a cantata inspired by the discovery of each landscape encountering an expectation, in Manessier’s work always marked by profound anxiety” (Peinture contemporaine, Gaston Diehl, Castermann, 1974). Manessier spent his childhood in Abbeville, where his parents were shopkeepers. He became aware of his calling to become an artist in front of the spectacle of the Baie de la Somme, when he was 12 years old: “landscape had a vital influence on me and I find this everywhere — Spain, Holland, Provence, Canada, Algeria… My eyes were opened, and I constantly return there,” he confided to Valère Bertrand (Impressions de voyage – notebooks in exhibition catalogue, Issoire, 1990). On holiday at Crotoy he mixed with the fishermen and painted from nature. He retained a feeling of nostalgia for the sea, immense skies and light of the North of France. In 1924 Manessier attended the École des Beaux-Arts at Amiens, before giving up the lycée to prepare for the entrance exam of the École des Beaux-Arts in Paris, entering the architectural section in 1929. Nonetheless, as has already been said, Manessier’s calling was to be a painter. He visited the Louvre to copy Rembrandt, and the master’s work made a very strong impression on him. He also admired Titian, Tintoretto, Rubens and Renoir. At the museum, he met the artist Le Moal, with whom a long friendship began. In addition to the great masters, “I was attracted despite myself by paintings that I did not understand,” he said referring to Picasso, whose work Manessier had discovered two years earlier. In 1932 he took a study trip to Holland. In 1933 he attended the free Académies at Montparnasse, and for the first time participated in the Salon des Indépendants, in which he also took part in 1934 and 1935, presenting works influenced by cubism and surrealism. In 1934 he joined his friend Le Moal in Provence, where they painted together at Eygalières. In 1935 they were at the Académie Ranson, where Manessier learned the technique of fresco painting in Bissière’s studio. For the Exposition Internationale in 1937, he was part of the team constituted by Robert Delaunay and Félix Aublet for the decoration of the Pavillon des Chemins de fer, which also included Le Moal, Bertholle and Estève. In 1938, Manessier decided to devote himself permanently to painting. He became a member of the group Témoignage, founded by Marcel Michaud in 1937, whose events in Lyons and in 1938 in Paris at René Bretea’s Galerie Matières (which in 1939 became the Galerie Matières et Formes) enabled him to meet up again with Bertholle and Le Moal. He visited Brittany and, in October, married Thérèse Simonnet. In 1939 the couple moved into number 203 rue de Vaugirard, where Manessier established the studio that he occupied until, in 1972, he was evicted. Gustave Singier was his neighbour. The outbreak of war surprised Manessier at Crotoy. He was called up for a few months, although demobilised again in 1940. He rejoined his wife and mother, who had taken refuge at Bissière’s house at Boissiérettes in the Lot, and found a place for them to live nearby at Benauge. In 1941, aided by Bazaine, he returned to Paris, where he taught at the association Jeune France (founded for the purpose of training instructors in different fields of cultural life on which it was intended that, after the war, they would have a positive influence, providing a new direction for the young. Jean Vilar, Jean Desailly, André Clavé, Pierre Schaeffer and Paul Flamand also took part), and also participated in the exhibition Vingt jeunes peintres de tradition française at the Galerie Braun. This exhibition is considered to have been the origin of the ‘non-figurative’ movement. In 1942, he bought a peasant house in the Perche: Le Bignon, where he welcomed Camille Bourniquel, Elvire Jan, Gustave Singier and Etienne Martin until the Liberation. In 1943 Manessier took part in the exhibition Douze Peintres d’aujourd’hui at the Galerie de France. In September of that year, with Camille Bourniquel, Manessier went on a three-day retreat at the monastery of the Grande Trappe de Soligny in the Orne, an experience which had the effect of a conversion on him, permanently marking his life and work. The remaining figurative references in his painting now disappeared. The rigour related to the close union between man and nature strengthened him in his search for a deep inner expression through a process he called ‘intériorisation’, in contrast with abstraction. This was a period of clandestine meetings held with Gaston Diehl above a small restaurant in rue du Pont-Neuf to prepare what became the Salon de Mai. In 1944 the Musée d’Art Moderne de la Ville de Paris acquired a first painting by Manessier, and he showed Les pèlerins d’Emmaüs at the Salon d’Automne. In 1945 the first Salon de Mai took place at the Galerie Pierre Maurs, 3 avenue Matignon; Manessier was a member of the Committee and showed Salve Regina, his first abstract painting which had been inspired by his monastic retreat (Musée de Nantes). In 1946 Manessier showed in the company of Le Moal and Singier at the Galerie Drouin, in an exhibition titled Trois Peintres organised by Camille Bourniquel. Religous subjects were mixed with landscapes of the Golfe du Morbihan. He said about his work: “I begin to paint when I feel a very close coincidence between the spectacle before my eyes and an inner state… continually oscillating between the inner and outer worlds… A moment of religious exaltation is met by the green and invigorating spectacle of nature awakening. This is the heart of my painting… The Christian should not become estranged from the forces of nature, otherwise man becomes cut off from his roots” (catalogue Galerie Drouin, 1946). This analysis echoes Manessier’s confidence to René Huyghe in 1945: “More and more, I would like to express man’s inner prayer and attain the sacred arts. My subjects are generally a religious and cosmic impression of man before the universe” (La Peinture actuelle, Tisné). This statement defines Manessier’s extremely personal style, indissociable from his spiritual commitment, expressed in his paintings by broken black interlacing contrasted with stains in different colours. His style developed, often influenced by encounters with new techniques. In 1947, for example, he began to work with stained glass, accepting a proposal from Canon Ledeur to create stained glass for the church of Bréseux near Besançon (1948–1950). It was soon considered that Manessier had revived post-war sacred art. His production in this field was indeed considerable and as significant as that of his painting: nearly 25 series to date in France (Arles, Le Pouldu, Hem, Pontarlier, Locronan, etc. ), Germany (Essen, Cologne, Berlin, etc. ), Switzerland (Basel, Fribourg, Moutier, etc.). The complete list, up until 1972, is to be found in the work by J.P. Hodin and in the Abbeville catalogue of 1990. In 1976, Manessier founded with Bazaine the ‘Association pour la défense des vitraux de France’. In 1948 he took several days to walk with Gustave Singier from Dieppe to Honfleur and spent that summer at Crotoy. In 1949 he had his first solo exhibition in Paris: at the Galerie Jeanne Bucher, with the theme of ‘Pâques’ (Easter), and at the Galerie Billiet-Caputo. His style became more intense, and he made increasing use of nuanced colours, with larger formats dictated by the subject’s importance. Manessier now occupied a leading position among the painters of his generation. At the Galerie Jeanne Bucher, he also showed a first album of seven lithographs, once again on the theme of Pâques, printed by Jean Pons. Manessier made a considerable number of prints, and print making had now become an important technique for him: 1958, 11 lithographs for three spiritual hymns to Saint Jean de la Croix; 1963 suite on Charles Péguy’s poem Présentation de la Beauce à Notre Dame de Chartres, with 64 fully lithographed pages. At the Salon de Mai in 1951 he showed Longwy la nuit (Museum of Turin), a work which marked an evolution that he described to J.P. Hodin: “During this period I found it increasingly difficult to tolerate transparency, dispersion or the explosion of objects which I owed to Lapicque’s influence… This painting enabled me to free myself. In it I managed to find the object again, achieving a simpler treatment of light and placing forms on a single plane” (Manessier, Ides et Calendes, 1972). He had his first solo exhibition abroad at the Galerie Apollo in Brussels, and spent the summer on the Ile d’Oléron. In 1952 he began working with the weavers Plasse-Le Caisne who now wove his tapestries and liturgical garments. His first orders for tapestries for the Manufacture des Borderies (Felletin) date from 1947. In 1960 Manessier painted L’estacade du Crotoy (Ministry of Industry). Between 1950 and 1952, he painted a series of works on the subject of winter. At the end of 1952 he exhibited a series of large works at the Galerie de France on the theme of the ‘Passion du Christ’. In 1953 he visited Turin for a solo exhibition and once more spent the summer at Crotoy, painting landscapes of the Baie de la Somme. In 1954 he continued working on this series of the North Sea, and in the same year showed Marée montante at the Salon de Mai. In 1953 he had a solo exhibition in New York at the Galerie Pierre Matisse and was also awarded the First Prize for Painting at the Sao Paulo Biennial. This luminous and agreeable period was brought to a close by the events in Hungary which inspired Manessier to paint a powerful and desperate work: Requiem pour Novembre 1956 (Staatsgalerie, Stuttgart). In 1958 he paid a first visit to Verdon in the Haute-Provence, and this generated a profound change in his style. The deep furrowed valleys, stripped by the mistral, unleashed forces in Manessier that produced a vigorous chromatic range of multi-coloured gems and violent, tormented movement (cf. the series inspired by torrents). He developed this body of work (drawings, wash drawings, paintings and pastels) during a stay at Moissac-Bellevue near Aups during the summer of 1959, then at Mas de Chausse, in the Montagnette, at his friend’s the architect Edouard Albert. After an exhibition of water colours in 1958, the Galerie de France showed the wash drawings with 20 paintings on the theme of ‘Provence’. In the catalogue preface dedicated to his friends Bourniquel and E. Jan, Manessier writes: “I am amazed by the exuberance of these drawings… like ‘works in their own right’… hardly had I arrived, I was seized by the frenzy of a work that was particularly new for me as it was not drawing: straight lines, flowing, alive, full of light and space, rhythms” (Manessier, Album Lavis de Haute-Provence, 1959). Between 1959 and 1962 Manessier included Provencal landscapes in mystic works that were consumed by an inner fire. When he saw these works on Passion and Pâques, Jacques Lassaigne decided to show Manessier at the 30th Venice Biennial, at which the artist was awarded the Grand Prize for Painting. In 1962 Manessier made a first visit to Spain. He returned there in the summer of 1963, staying in Valencia and at the Ermita de Luchente, to which he returned in 1965, 1966 and 1969. For him this was the country of Saint Jean de la Croix, El Greco and Goya, whose work had made a strong impression on him. Under this new influence his work blossomed, the pictorial language becoming increasingly free with strong colours and a more emphatic style. The works inspired by Spain were shown at the Galerie de France in 1966, with texts by Jacques Lassaigne and Don Alfonso Roig, a priest and professor of art history with whom Manessier had worked. He also painted a series of night landscapes, which perhaps inevitably led him towards sacred subjects, such as the holy Faces done by mixing earth and paint. Two visits to Canada, in 1967 and 1969, finally brought Manessier peace. The refracted light on the lakes contributed an extreme refinement to his colours and, despite the winter cold, he experienced a feeling of completeness in the immense silent spaces. His works now adopted a more elongated format. He gave a talk in the French Pavilion at the Montreal Universal Exhibition. The Canadian landscapes – paintings and wash drawings from 1967 to 1969 – were shown at the Galerie de France in 1970, with a text by Michel-Georges Bernard: Nature et peinture dans l’œuvre d’Alfred Manessier. From 1955 there were solo exhibitions at the Musée de Tourcoing and the Palais des Beaux-Arts in Brussels (catalogue). 1958 and 1959 in Hanover, Essen and Zurich, with texts by Werner Schmalenbach; 1959 at The Haig, Essen; 1961 Musée d’Amiens; 1962 Aix-en-Provence, Galerie Tony Spinaz-Zola, drawings, prints, 12 lithographs illustrating Les Cantiques spirituels by Saint Jean de la Croix; 1964 The Phillips Collection, Washington, catalogue with an interview conducted by Jean Clay; Notre Dame University (Indiana); 1965 Maison de la Culture, Caen, Oslo and Lund, with a preface by Ole Henrik Moe. Other major exhibitions have followed up to this day. The first retrospectives were held from 1967 in France, Amiens, Rennes, Montpellier, Bourges, Toulouse and, in 1969, at the Musée de Metz, with works from 1935 to 1969, and a preface by Bernard Dorival, also included for the retrospectives at the Musées de Luxembourg and Trêves, in the same year, and in 1970 at the Musée de Dijon. 1972 Paris, Musée d’Art Moderne de la Ville de Paris. Series of 12 tapestries on the subject of the Cantiques spirituels by Saint Jean de la Croix. Among the many national and international group exhibitions: 1949 La Nouvelle Peinture française, Musée de Luxembourg. 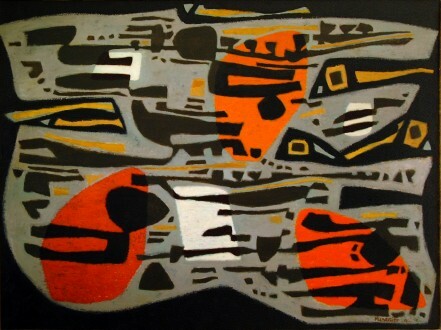 1950 French Art, South Africa; Gouaches, printemps de la peinture with Lanskoy, Bazaine, Lapicque, Magnelli and Léger, Galerie La Hune, Paris. 1951 Painting of Today France-Italy, Turin, 1953, 1954, 1957 ; and in 1951 Hommage à Georges Rouault pour son 80e anniversaire, Palais de Chaillot, Paris. 1954 Younger European Painters, Guggenheim Foundation, New York. 1955 Sacred Art, Vienna; Manessier-Le Moal, Galerie Blanche, Stockholm and Institut Français, Copenhagen; New Decade, travelling exhibition, USA; Modern French Painting, Spain; Exposition internationale de gravure Ljubljana and in 1959. 1956 Festival de l’Art d’avant-garde, Cité Radieuse, Marseille; École de Paris, Munich. 1957 Peintres de la Galerie de France, Galleria dell’Ariete, Milan. 1958 De l’impressionnisme à nos jours, Musée d’Art moderne, Paris; Exposition internationale Brussels and talk. 1959 Dessins des artistes de l’École de Paris, Galerie Creuzevault, Paris. 1960 Exhibition of Contemporary French Art, Israel, Göteborg. 1961 L’estampe française contemporaine, Musée Cantini, Marseille; Exhibition of French Art, Moscow. 1962 École de Paris, Tate Gallery, London; Exhibition of Contemporary Sacred Art, Rome. 1963 Exhibition of Contemporary French Art, Canada, Yugoslavia. 1965 Eighth International Exhibition of Contemporary Painting, Japan. Manessier participated in the Kassel Documenta in 1955 (I), 1959 (II) and 1964 (III). Carnegie Institute, Pittsburgh in 1951; in 1955 he obtained the Grand Prix de Peinture with Couronne d’épines (Pittsburgh Museum) and in 1958. He exhibited regularly at the Salon de Mai from 1945. Invited to participate in l’École de Paris, Galerie Charpentier, from 1954 to 1958. We should also mention the creation of 340 costumes and stage sets for Decameron by Boccaccio, a ballet by Léonide Massine for the Nervi Festival (Italy) in 1960, and in 1963 the costumes for Brecht’s Life of Galileo at the Théâtre National Populaire (TNP). In 1956, Manessier acquired a farmhouse with outbuildings at Emancé in the Beauce (near Chartres, where François Lorin, who had been his master glass maker since 1948, worked), where he now spent much of his time. He worked there on his paintings – not more than 15 to 20 a year – prepared in his Paris studio. In 1972 he moved permanently to the Beauce. Manessier’s work was considerably enriched by the different media he practised. Among his late work: stained glass for the cathedral of Saint-Dié (1986), stained glass for the choir of the church of Saint-Sépulcre Abbeville (1989), canvas 2.30 x 6 m, Liberté, Liberté, Hommage à l’Abbé Grégoire, Galerie de France, Paris, 1989. 1983–1984 Alfred Manessier 83. Galerie de France, Paris. Catalogue, text by Pierre Encrevé. 1986 Manessier peintures et lavis 1948–1985. Noroît à Arras. Catalogue. 1989 Manessier, Le Paysage, peintures 1945–1985. Conversation with Pierre Encrevé. Centre culturel Issoire. Catalogue. 1990 Manessier œuvres 1927–1989. Musée Boucher de Perthes, Abbeville. Catalogue, text by Camille Bourniquel. Complete biography and bibliography. 1990 Manessier, œuvre monumentale. Château de la Roche Jagu, Ploézal-Pontrieux. Catalogue. 1992 Hommage. Rétrospective Manessier. Grand Palais, Paris. Catalogue Skira. 1992 Manessier et le vitrail 1948–1993. Centre départemental du Vitrail, Chartres. Catalogue. Manessier is present in museums throughout the world. In France: Paris National and Municipal d’Art Moderne. Mobilier national – Amiens – Beauvais – Dijon (with the Donation Granville) – Dunkerque – Grenoble – Le Havre – Lyons – Metz – Meudon – Nantes – Rouen – Saint-Dié – Saint-Etienne. Jean Cayrol: Manessier. Le Musée de Poche. Fall, 1955. Jean-Paul Hodin: Manessier, monographie. Ides et Calendes, Neuchâtel, 1972. Martine Martin: Manessier, œuvres de 1935 à 1960, directed by Jean Laude. PhD thesis: Arts plastiques, Paris I. In preparation, the catalogue raisonné of the paintings, by Christine Manessier.